If you need data to support a report you are writing, add credibility to a grant proposal, or want to understand your target market area by demographic, social, economic, and housing factors; this information is available through the US Census and American Community Survey. 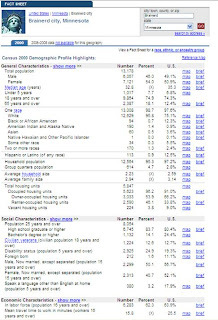 Access this information at http://factfinder.census.gov/ The 2010 Census data will be available in February-March of 2011. 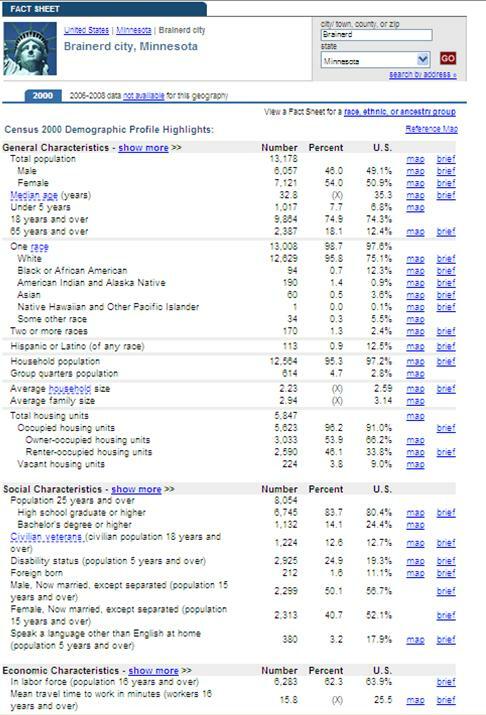 However in addition to the 10 year census the American Community Survey data is available. Information you can find includes: marital status, educational attainment, language spoken, veterans status, place of work, value of home or monthly rent paid, number of room in each housing unit, yea someone moved into a residence, vehicles, utilities, taxes, and insurance. See the Brainerd community profile at the right as an example.